Michael Franti & Spearhead return to Asheville on Friday, July 27 to headline the Riverkeeper Beer Series at the Salvage Station for the second year in a row. The show is presented by MountainTrue and 98.1 The River, with proceeds supporting the work of the French Broad Riverkeeper – a MountainTrue program that serves as the primary protector and watchdog of the French Broad River Watershed. Michael Franti is a world-renowned musician, filmmaker, and humanitarian who is recognized as a pioneering force in the music industry. 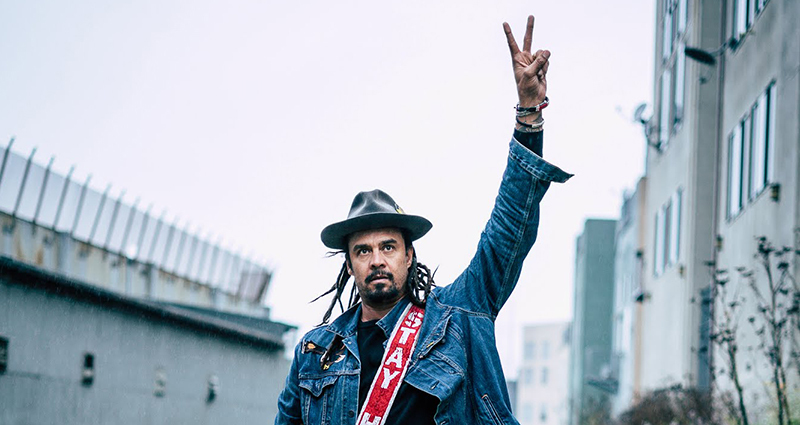 Franti believes in using music as a vehicle for positive change and is revered for his energetic live shows, political activism, worldwide philanthropy efforts and authentic connection to his global fan base known as the SOULROCKER FAM. June 2 – Cleanup of the Swannanoa River with beer release party at the Wedge at Foundation. To learn more information and register for the Riverkeeper Beer Series events, visit MountainTrue.org. Tickets: Tickets go on sale March 28 at 10am for Michael Franti fan club members, and will go on sale for the general public March 30 at 10am. Tickets are available at the Salvage Station or online at SalvageStation.com. General admission tickets are $33.50 and include a download of Franti’s newest album. VIP tickets are $110 and include a VIP pre party from 5-7pm at the Salvage Station, an acoustic performance by Michael, a fully catered meal, booze at the pre-party and a special roped off viewing area with a private bar. The Riverkeeper Series is sponsored by MountainTrue, Asheville GreenWorks, 98.1The River and French Broad Outfitters. Other sponsors include Wedge Brewing Company, Wicked Weed Brewing Pub, New Belgium Brewing Company, Sierra Nevada Brewing Company, Oskar Blues Brewery, Sanctuary Brewing Company, Catawba Brewing Company, WNC Magazine, Mountain Xpress, and Recover Brands. MountainTrue champions resilient forests, clean waters and healthy communities in our region. We engage in policy advocacy at all levels of government, local project advocacy and on-the-ground environmental restoration projects. Primary program areas include public lands, water quality, clean energy, land use/transportation and citizen engagement. We are also home to Riverkeepers for the French Broad, Watauga, Green and Broad Rivers, who are the primary defenders and spokespeople for these waterways. For more information: mountaintrue.org. With thousands of volunteers, Asheville GreenWorks engages the community in grassroots projects such as urban forestry, environmental cleanups, anti-litter and waste reduction education, creation of green spaces, care and preservation of Asheville’s rivers and trees. Through our work, Asheville has been designated as a Tree City USA for 37 years.